Mostyn Farm ride with William Blane! After winning the Area 5 qualifier at Eirias Park on the 19th March the Cheshire Hunt North Quiz team had just under two weeks to prepare for the Quiz Final. A total of 29 teams from all over the country competed at Addington Manor on the 2nd April with 18 Branches and 11 Centres taking part in the Quiz Final. After a short briefing the quiz got under way and then after the first four rounds the teams had a break for lunch. After lunch the teams were spilt with the seniors heading off to do their individual practical round leaving the junior pair to answer their questions on “Keeping A Pony at Grass”. The pairs swapped over with the juniors doing their individual practical round and the seniors their pairs round on “Worming and Paddock Maintenance”. After a short break, the results were up and the girls from CHN were absolutely delighted to win. It was the first time at the finals for youngest members, it was Hannah’s third year in a row at the finals and for Georgina it was the second time she had won the Quiz Final. An enormous ‘Thank you’ to Anna Sherry and Sarah Hodgson who give up their time to coach the quiz teams. Enter and pay online via www.cheshirehuntnorthpc.com or by post using the official entry form. POSTAL ENTRIES TO: Joan Deakin, 2 Broomfield Barn, Trap Street, Somerford Booths, Congleton, Cheshire, CW12 2LT. 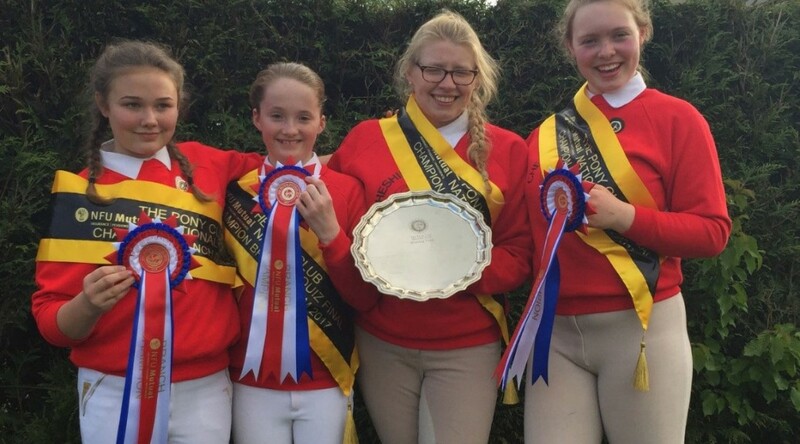 PC members any age not to have represented their branch at Area Novice or above in Show Jumping or Eventing. Branches can indicate teams as a practice for the Regional Championship qualifier. Members to enter directly then teams may be submitted to j.deakin@stb.coop by the District Commissioner. Classes 7 – 9 Dressage Test – Pony Club Introductory Dressage Test 2007. Test can be commanded (called).